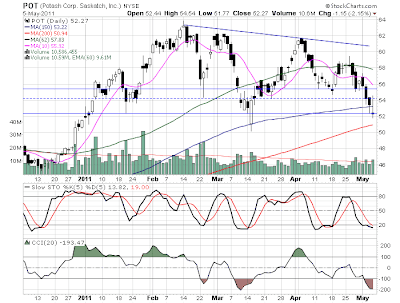 F - The stock is sitting on trend and SMA support while being oversold. IMO, its lack of eps growth, quarter-to-quarter, will have it channel trade between low/mid 15-to-mid 17s until it starts growing eps, starts issuing a dividend or the market gives it a multiple higher than single digits (which it should). 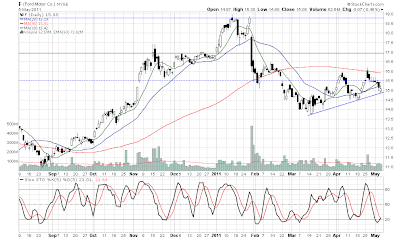 POT - It has been consolidating from its high for some time now, and with the recent negativity, very oversold. The 150SMA was acting as a spring board until the market just lost its floor. 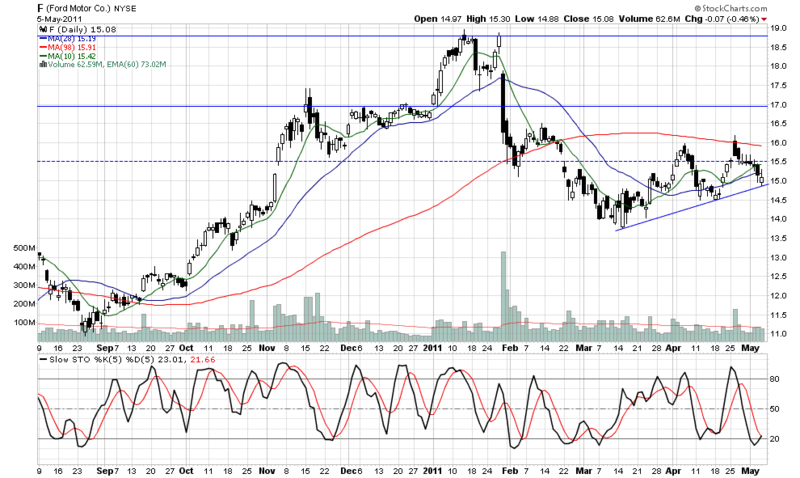 POT looks to be at the low end of the consolidated trading range. I was patiently waiting to re-enter the agricultural plays, and the technical set up is too enticing. ATI - I am patiently waiting to get my enter point. With the multiple additions to my portfolio, I can not afford little discipline right now. Intra-day, high 68 is looking like a support, but I would like to enter around 66. LLNW - Limelight (I keep thinking of the NYC nigh club back in the day, now a nice market place, when I use the company name :) reported a nice quarter. Tonight's interview on MadMoney just adds to the fundamental story. 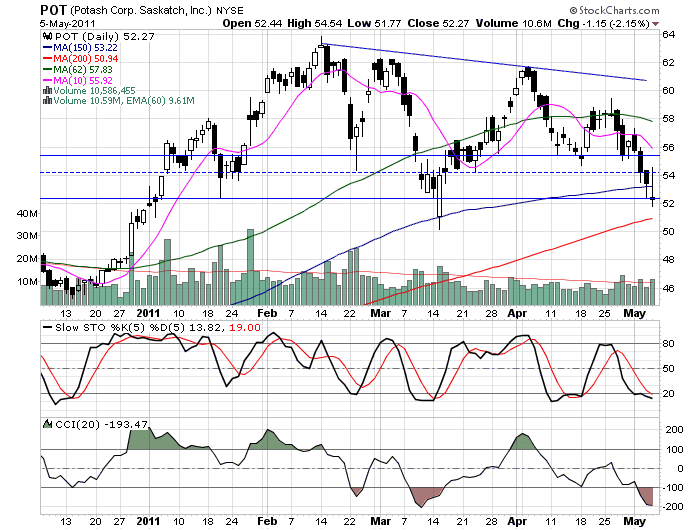 The positive bias in AH looks like the support and oversold condition will act as a spring board. Relative to POT, I followed you into it earlier, and perhaps it will enjoy some bounce here; but my concern is the following. Numerous commodities have recently been sharply correcting (or perhaps collapsing); they, largely like POT itself, seem to move very much inversely to the dollar. Finally the dollar is showing some firming, and overall, at least, I feel further strength is likely--following some deficit reduction agreement, for example. After all, if the dollar collapses, we have catastrophic inflation; and I think the administration is already worried about price increases now. I hope this gives you some agreeable cause for consideration, and I'd be delighted to here your own analysis. With respect to companies, I am not too concerned about dollar movement. All global companies actively hedge against major currency swings. So I do not agree with the thesis that 'stocks-are-up-cause-dollar-is-down'. Specifically, with POT, a dollar-POT chart overlay, imo, does not show a significant correlation. I do agree with your general thesis if the commodity is based on the US dollar. However, there are so many other factors with commodity prices, the most important being Supply/Demand. (I include a commodity's 'rate-of-use' w/the Supply/Demand factor.) But last week we saw more then just supply/demand play out. For instance, silver got a double whammy last week. Silver traders were dealing with increased margin requirements, then they got knocked with a rallying dollar due to Trichet's comments. Anyone trading the pure commodities probably got very scared about what they saw in the silver market over the past two weeks. Margin requirements increase very rapidly, and surprisingly. If it happened in silver, it can happen in any other commodity. (And, frankly, I hope the exchanges start increasing the margin requirements.) Oil does not decline 10% in one trading day because of a two-day dollar rally. I think there was more to it, and I think it was the fear of increased margin requirements in combination to a rallying dollar. With POT, I am far more concerned about the overall supply/demand trend with agriculture, and the overall need of fertilizer to realize the supply side. Whatever kind of "fear" (i.e. dollar rising) allowed POT to get this oversold, so be it. But based on the supply/demand info that I have seen, I do not think 'the fear' is merited.